Can I Reinforce My Deck's 4x4 Carriage Bolted Supporting Girders with a Cleat System? I need to correct the main girder 4x4 supports for my deck. It is 4' off the ground. The 2x8 beam girders are carriage bolted to the 4x4 support posts. There are 2 girders, one on each side of the 4x4. The picture shows the issue as an example (not my deck). I realize the carriage bolts alone are not enough support for the girders. This is a 20 year old deck built by a previous owner and overall is in good shape. Is it okay to sister (cleat) a 2x4 on each side of the 4x4s, sitting under the girder beam? The 2x4 would extend down to the footing pad and sit on a 1" spacer to keep it from contacting the concrete pad. Or is better to sister a 4x4 on each side of the current 4x4 post for increased girder support? Regardless of which board size is needed: What is the best way to fasten the top of the 2x4 or 4x4 sister to the girder beam? Should I use a simple mending plate or something like the Simpson Strong Tie 4x adjustable post cap? To me, the Strong Tie seems like it will work with both board sizes, the 2x4 or 4x4. You bring up some very good questions. I will do my best to answer them. As always, it would be wise to check with your local building inspector to see what your local requirements are. Yes, it is acceptable to add a cleat on each side of the 4x4 support post. Cleating is a side mounted support along the post, underneath the beam. This is a great way to reinforce the support post and add girder support. Cleating will provide extra support for the 2x8 beam, but it may not be entirely necessary. The carriage bolts should be strong enough to support the girders. However, it is always better to have the added support. Why not, its an easy enough job which will provide you with piece of mind. 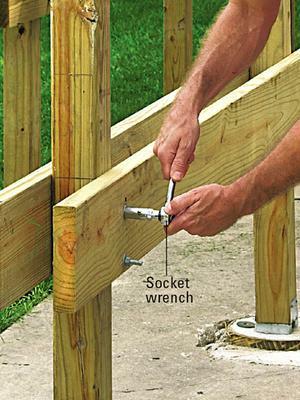 It is not necessary to extend a cleat down the entire length of the post nor is attaching another 4x4 post against the existing post necessary. That is all over kill. A simple 12" long 2x4 cleat screwed to the side of the post with numerous #10x3-½" ACQ compatible screws or larger is more than enough. If you want to run the cleat down close to the bottom of the post that is your decision. The weight from the 2x8 beam or girder as you refer to will now be supported by the cleat underneath it rather than just the horizontal ½" carriage bolts. You have described a side mounted method of securing the beam to the post. This is generally no longer done. It is not fatal however and with the cleat system described above you will have a strong structure. Typically, we sister two 2x8s and screw them together to create one 4x8 beam. After we cut a rabbet out of the top of a 6x6 post and rest the beam on the shoulder of the rabbet cut to support the direct downward forced. Then we use the ½" carriage bolts to firmly attach the beam to the side of the vertical member of the post. You mentioned using one of the Simpson Strong Tie 4x adjustable post cap. That is a good solution but is intended for securing a beam directly on the top of a post of identical dimensions. For example, a 4" beam on a 4x4 post or a 6" beam on a 6x6 post. This is not what you have described in your question. So overall in the industry today, there is a movement away from side mounting beams to posts so as not to rely entirely upon the strength of the beam and the carriage bolts. Comments for Can I Reinforce My Deck's 4x4 Carriage Bolted Supporting Girders with a Cleat System? Correct all beams/headers require 1 1/2" of bearing min. A good source of information on decks download DCA62012-DeckGuide as a building inspector I carry this in my truck at all times, I hand this reference material out like candy..